Infants Remembered In Silence (IRIS) - What is IRIS? IRIS is funded 100% by donations and memorials. Below please find a list of options available through IRIS with a short description. Each of these items are options that are presented to parents following the death of their child before birth, after delivery or in the years following an infant death. This unique program is designed to assist parents from the time that they have found out that their child has died, through delivery, in the hours following delivery, and through the funeral. Advocates assist parents with a variety of services, including explaining delivery options, acting as a doula (labor coach), assisting with creating precious keepsakes and memories. This includes bathing and dressing the baby, to taking a variety of pictures, taking hand and foot prints, castings and much more. On an average an IRIS Advocate will spend 8 - 12 hours working with a family in the hospital setting and/or 4 - 6 hours working with a child in the funeral home setting. (Currently available only in Dodge, Goodhue, LeSueur, Steele, Rice and Waseca counties in southern Minnesota). Please contact us regarding the IRIS Advocate Training Program and learn more about how to bring IRIS to your facility/community. The type of Packet that a parents would receive is based on the type of death. Packet types are designed for early pregnancy loss (ectopic pregnancy, miscarriage etc. ), stillbirth / neo-natal death / early childhood death. Each packet contains information on the type of death, poems, information for fathers, a book for grandparents, a pamphlet for family/friends, booklet on how to plan a funeral or memorial service, a journal, a listing of characteristics of bereavement, understanding grief, grieving as a couple, suggestion on creating loving memories, how to protect photos, a bibliography, newsletters and information on other services provided by IRIS. Designed for infants 2 - 24" in length. Each boxed set includes a hooded outfit (boy or girl), afghan/blanket/quilt, cap, a shell for baptism/blessing, baby bath, baby lotion, tape measure, a zippered bag for a lock of hair. This service is provided for parents who have delivered a child before the gestational age of 20 weeks at District One Hospital in Faribault. IRIS provides a burial and memorial service twice a year for these infants. (This option is available if the parents choose not to do a private burial.) As of October 30, 2008 there are 528 infants buried at this site. The IRIS newsletter is published quarterly, and contains a wide range of information including upcoming events, meeting dates and times, poems and much more. The IRIS Charity Weekend is held the weekend after the super bowl in February. Saturday is Family Fun Night at the Community Center and Sunday is pancake breakfast, bingo, bake sale and silent auction. The IRIS Balloon Release is held the first weekend in October at Kinder Park in Faribault, MN. The park is dedicated to the memory of our children. Parents, family and friends are invited to a potluck picnic lunch and the balloon release. This breathtaking, candle lighting service is held the first Sunday in December at 2pm at the Chapel of the Good Shepherd on Shattuck Campus; 1000 Shumway Ave. in NE Faribault Minnesota. This service is attended by hundreds of parents who have had a child die and wish to remember them during the holiday season. 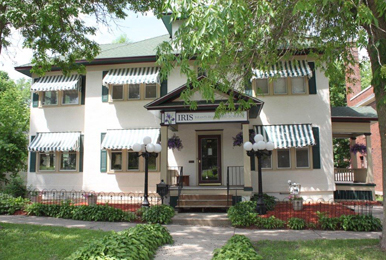 IRIS offers regular monthly support group meetings. Currently this includes our midday meeting on the 2nd Wednesday of the month from 11am - 1pm and the evening meeting on the 4th Tuesday of every month from 7 - 8:30pm. All meetings are held at the IRIS office. This service is provided for any parents who would like to visit in our office, or on the phone.